Canadian researchers have found that the September back-to-school period brings a dramatic increase in hospitalizations for children with asthma. This increase starts after the return to school and reaches its peak in September. This period is now recognized as the September Asthma Peak. Being ready for the September Asthma Peak is one way to help ensure that your child will be spending more time with friends at school, and less time at home, or worse – in the emergency room of a hospital. Research shows that more than 60 per cent of children admitted to emergency rooms with asthma also suffered from rhinovirus (the common cold). Rhinovirus and other respiratory infections are common triggers of asthma symptoms, especially among school-aged children. Other studies suggest that up to 85 per cent of childhood asthma attacks may be triggered by viral infections. These attacks are also associated with a rise in seasonal allergens and reduced compliance with asthma controller medications. What Makes September Worse Than Other Months? Kids returning to school in September face increased exposure to viral infections. These can be a significant trigger of asthma symptoms. Children may also be exposed to allergens such as dust mites, moulds and animal dander. September is also the ragweed season. All these allergens are potent asthma triggers. This is why it is so important that your child’s asthma be adequately controlled year-round. “When children go back to school in September, they face increased exposure to viral infections which can trigger asthma symptoms.” — Neil Johnston, Epidemiologist, Firestone Institute for Respiratory Health, St. Joseph’s Healthcare, Hamilton, Ontario. Asthma attacks occur when the airways become inflamed or swollen and produce mucus. This is usually caused by exposure to asthma triggers such as allergies, exercise, colds and other viral respiratory infections. The muscles around the airways start to spasm and constrict, narrowing the airways and making it difficult to breathe. Always ensure that your child has his or her rescue medication on hand at all times. This will not treat the underlying inflammation and prevent asthma attacks, but it is what your child will need most should an asthma attack occur. The Asthma Action Plan is an effective tool that can be used to help manage your child’s asthma and help ensure that it stays adequately controlled. List your child’s triggers, daily medicine needs and the rescue medicines he or she may need for quick relief during an asthma attack, or when signs of an attack begin to show. Tip: share your child’s Asthma Action Plan with your child’s school, teachers, babysitters and your family members. It would also be a good idea to visit your child’s school to ensure it has policies in place to help create a trigger-free environment for learning, exercise and play. Asthma Canada has a best practices guide to Asthma Management in Schools with tips and recommendations for administrators, educators, parents and kids. If your child shows symptoms of asthma when he or she gets a cold, talk to your doctor about which medication might be appropriate for preventing asthma attacks that may be triggered by common cold viruses. Keep a diary of how your child is feeling at different times of the day. Keep track of how regularly your child is taking his or her asthma medications. Also note any other things that may appear to worsen your child’s asthma. These may include exercise, colds, allergies, tobacco smoke, household cleaners, weather changes, etc. Learn your child’s warning signs and try to catch an attack before it gets worse. Talk to your child’s doctor if you feel the need to make any changes to your child’s action plan. Develop or update a written Asthma Action Plan with your family doctor and make sure to provide a copy to your child’s school. Speak to your child’s school about their asthma policies including inhaler use. Identify triggers that make your child’s asthma worse and teach him/her how best to avoid them. Treat allergies with anti-histamines, nasal steroids, allergy shots or pills, to help avoid an asthma attack, as per recommendations from your physician. Ensure your child takes his/her asthma medication throughout the year, even when symptom-free. Help your child understand their asthma, including teaching them how to use their medication properly and knowing how to monitor their daily symptoms. Teach your child correct hand-washing techniques and the importance of hand-washing to avoid catching a cold. If your children are sick, keep them home from school. Ensure your child, and everyone in your home, has received their influenza (flu) vaccination. Schedule regular asthma check-ups with your healthcare practitioner to ensure your child’s asthma is properly controlled. With the start of a new school year, kids are in close contact with each other and germs, like the common cold. Colds are the most frequent asthma triggers in young children, causing up to 85 per cent of exacerbations. Low use of appropriate asthma medications may fuel what is known as the “September Asthma Peak,” the spike in children’s hospital admissions due to serious asthma attacks aggravated by colds. Low use of medications or sub-optimal control of underlying inflammation can also increase asthma attacks throughout the school year. Compliance and filling of asthma controller medications decreases during the summer months causing airway inflammation to return. Even when children with asthma display no symptoms, they must continue their medication to avoid inflammation. The viruses responsible for the majority of “September Asthma Peak” asthma exacerbations include the rhinovirus, coronavirus, influenza virus, parainfluenza virus and respiratory syncytial virus (RSV). School-aged children have on average eight colds per year, which can translate into about one asthma flare-up per month if a child’s asthma is not well-controlled. Approximately 20 to 25 per cent of annual hospital admissions for asthma of children in Canada occur in September. Because the cold season can last for several months, parents should be extra diligent about adhering to an asthma management plan throughout the year. Asthma Canada is pleased to launch the Preventing the September Asthma Peak campaign to educate children, their caregivers and teachers about the significant spike in the number of children requiring hospital treatment as a result of asthma attacks during the month of September. Working in conjunction with an educational consultant, Asthma Canada created classroom materials for grades four to six, which dovetail with the Ontario curriculum. 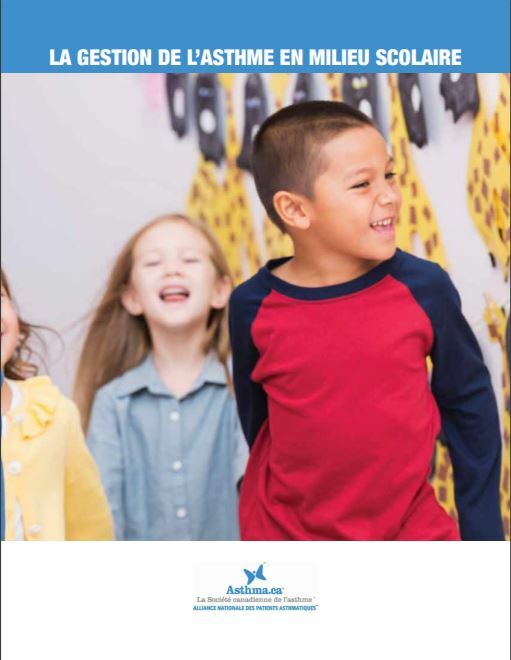 The classroom materials offer teachers information on asthma as well as on the September Asthma Peak and lesson plans to help educate students. 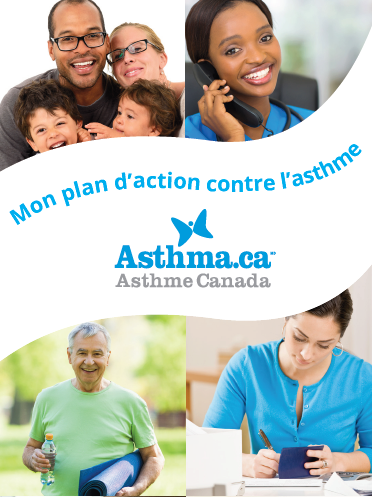 To download Preventing the September Asthma Peak materials in English and French, including lesson plans for grades four to six, and information sheets for students and parents, please click on the links below. Back to School brings sick days and visits to the hospital for children. Learn how to avoid September Peak through proper asthma management. Patient-developed resource to educate parents, schools and children on the roles and responsibilities for asthma-friendly environments. An Asthma Action Plan is a strategy that you can use to identify when your asthma may be flaring up and how to manage your asthma when it gets out of control. Studies have shown that having a written agreement with your doctor helps you manage your asthma at home. Take this sample action plan with you to your doctor to start a discussion. A recording of our webinar with guest speaker Susan Balkovec, Registered Respiratory Therapist and Certified Asthma Educator. 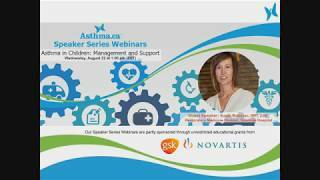 Watch her presentation to learn about some of the best practices for managing your child's asthma and what support they may need during the September asthma peak. 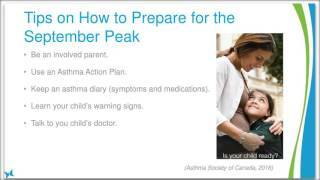 Spend a half hour with Asthma Canada's Certified Respiratory educators learning about the best ways to avoid the September asthma peak. Watch as they discuss useful tips, how to create an asthma action plan, classroom triggers and strategies to avoid them, emergency response to an asthma exacerbation in school and much more.